Molly Reynolds is a beautiful widow with a young son who lives with her aunt and uncle in Alder Gulch, a small mining town in the Montana Territory. She and her mother moved there from Frederick, Maryland five years earlier, after she lost her husband in the battle at Antietam during the Civil War. When her aunt becomes sick, she begins escorting Gavin Jr to school instead of going off to work in a sewing circle each day. She is soon glad that she took on this new task, because a handsome and friendly face from her past appears one afternoon while she is meeting her son. Sweet and charming Bobby Wallace doesn’t seem to have aged a day. She is more than happy to help him take care of his two daughters. But can they also rekindle the love they had for each other all those years ago? 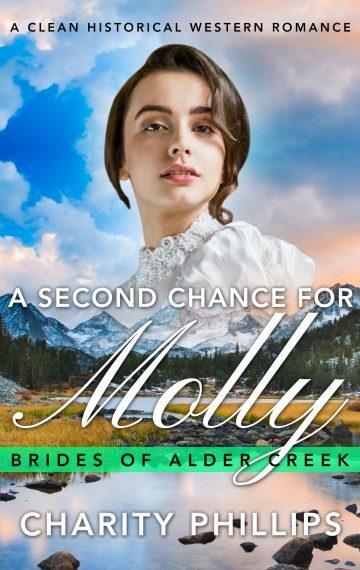 A Second Chance For Molly is a standalone 20,000 word clean historical Western romance.